The Crystal of the Day for Wednesday 4 September 2013 is Spinel in Matrix. These tumbled stones are hand polished from India and full of bright red and pink Spinel Crystals surrounded by the charcoal gray and black matrix in which they grew. Spinel forms in sparkling eight-sided crystals in a range of colors. Such red and pink Spinel Crystals were often confused with Rubies or Pink Sapphires throughout history. Spinel is a stone of calm and renewal. Offering encouragement in difficult situations, Spinel can help ease a situational crisis like a job change or a divorce. Spinel lowers stress and anxiety, and physically reduces inflammation. Associated with the Root Chakra, Red Spinel specifically stimulates physical vitality and strength. 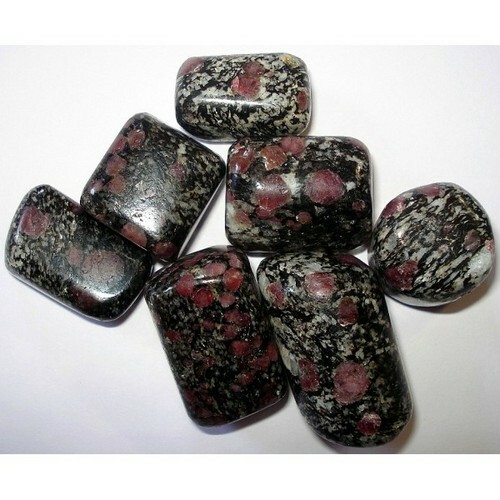 Red Spinel’s energy renewing properties increase the user’s ability for self-healing, and also arouse Kundilini Energies. Pink Spinel offers gentle energy renewal, and is useful to those suffering from chronic conditions and fatigue. Protective in a quiet gentle way, Pink Spinel can be used as a Talisman to carry the love of the giver. This makes Pink Spinel a great stone for long-distance relationships or times when couples cannot physically be together. Sometimes called the “Fairy Godmother” stone, Pink Spinel is also a good gift for children, holding the continuing love and protection of the giver.